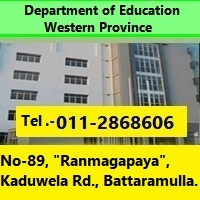 Maintaining the personel files of all the officers in the western provincial Department of Education, their compulsory retirement matters, receiving the commuted grativity, preparing the pensioners pay schemes and duties related to loans of all the staff members. Attending and taking prompt actions to various kinds of letters, applications, appeals, instructions related to institutional purposes of all the officers in the zonal education offices and non-academic staff, informing disciplinary decisions and reinstatement procedures. Making effective maintainance of records and information reports related to institutional purposes of officers in the zonal education offices. Official/ Official residential telephone for officers of Department and Zonal Education Offices. Updating the information of all the institutional matters related to request for O.T. 1/20 allowances and quarters. Attending to matters pertaining to overseas leave, special leave, study leave of Teachers belongs to Sri Lanka Teacher Service and Principals who work at all provincial/ National schools in western province. Attending matters concerning temporary releasment to work for Goverment Co-operations and constitutional boards, giving solutions to the teachers problems related to teachers institutional matters. Giving necessary information related to provincial council problems, committee council of public petitions, advisory committeee councils, parliamentary problems, humann rights commission, various judicial procedures.